A nourishing highlighting balm, ideal for maintaining dyed hair and for grey coverage. 85 to 100% of ingredients are from organic farming. - 85 to 100 % of ingredients are from organic farming. - Extracts from plant concentrates: plant extract, argan oil, jojoba, apricot. - No synthetic surfactants or fragrances. - Free from parabens, phthalates, ammonia, paraphenylenendiamine, resorcinol, without oxygenated water, salt , lead salt, aluminum, silicone and BPA. - Adds shine, nourishes, repairs and protects hair. - Apply for 5 minutes for a light shine. - Apply for 10 minutes for medium intensity. - Apply for 15 to 30 minutes for an intense shine and colour. Beliflor has always designed its range of colouring products to be kind and gentle to hair while ensuring the greatest results. That's why Beliflor were one of the first to ban ammonia and lead salts in their colouring & dye products. 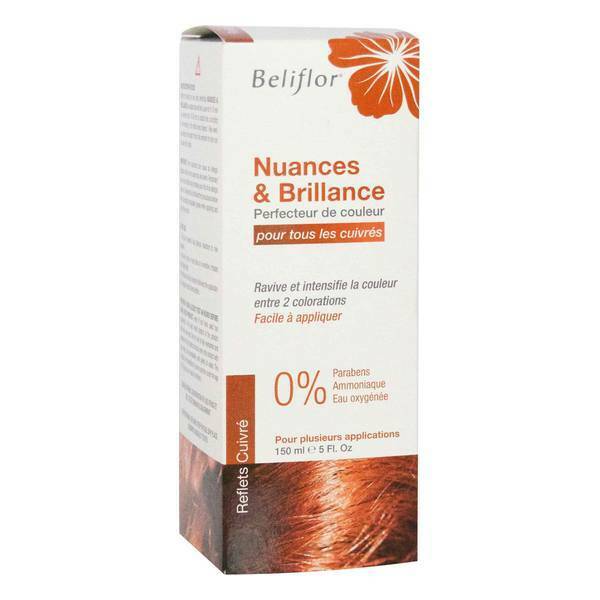 The Beliflor slogan demonstrates their commitment to healthy hair: "Natural health and beauty for hair". Beauty products and dyes produced by Beliflor are made with almost all natural organic ingredients and plant extracts, and are free from harmful substances like ammonia.